Whizolosophy | What Does the Bible Say About Church Giving? What Does the Bible Say About Church Giving? For the sake of this study, I’d like to focus on the fourth group of people, those who’ve never looked at what the Bible says about giving. When my husband and I were looking for a good church, we observed that some churches seemed to always be asking for money. This concerned us. When we found our current church home, we were truly impressed to learn that the church did not receive a formal offering during the service. The church does have offering boxes in the building, but members are never pressured to give. Money, tithing, and giving are only mentioned when our pastor happens to be teaching through a section of Scripture dealing with these issues. But please don’t misunderstand! We love to give. That’s because we’ve learned something. When we give to God, we get blessed. And although most of our giving goes to the church, we don’t give to a church. We don’t give to the pastor. We give our offerings to God alone. In fact, the Bible teaches us to give, for our own good and for our own blessing, from a cheerful heart. But don’t just take my word as proof that God wants us to give. Let’s look at what the Bible says about giving. 1. God values our offerings differently than men do. 2. Our attitude in giving is important to God. The text says Jesus “watched the crowd putting their money into the temple treasury.” Jesus observed the people as they gave their offerings, and he watches us today as we give. If we give to be seen by men or with a stingy heart toward God, our offering loses its value. Jesus is more interested and impressed by how we give than what we give. We see this same principle in the story of Cain and Abel. God evaluated Cain and Abel’s offerings. Abel’s offering was pleasing in God’s eyes, but he rejected Cain’s. Rather than giving to God out of thankfulness and worship, Cain may have presented his offering with evil or selfish intent. Maybe he had hoped to receive special recognition. Regardless, Cain knew the right thing to do, but he didn’t do it. God even gave Cain an opportunity to make things right, but he chose not to. This illustrates again that God watches what and how we give. God not only cares about the quality of our gifts to him, but also the attitude in our hearts as we offer them. 3. God doesn’t want us to be overly concerned with how our offering is spent. At the time Jesus observed this widow’s offering, the temple treasury was managed by the corrupt religious leaders of that day. But Jesus did not mention anywhere in this story that the widow should not have given to the temple. Although we should do what we can to ensure that the ministries we give to are good stewards of God’s money, we can’t always know for certain that the money we give will be spent correctly. We should not be overly burdened with this concern, nor should we use this as an excuse not to give. It’s important for us to find a good church that is wisely managing its financial resources for God’s glory and for the growth of God’s kingdom. But once we give to God, we don’t need to worry about what happens to the money. This is God’s problem to resolve. 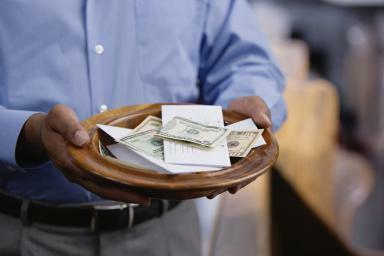 If a church leader or a ministry misuses its funds, God knows how to deal with them. This verse speaks for itself, don’t you think? The picture of our financial giving simply reveals a reflection of our lives surrendered to God. When we truly recognize all that Christ has done for us, we will want to offer ourselves wholly to God as a living sacrifice of worship to him. Our offerings will flow freely from a heart of gratitude. In conclusion, I’d like to explain my personal convictions and offer a challenge to my readers. As I’ve already stated, I believe tithing is no longer the law. As New Testament believers, we are under no legal obligation to give a tenth of our income. However, my husband and I feel strongly that the tithe ought to be the starting point of our giving. We see it as the minimum to give, a demonstration that everything we have belongs to God. If you’re not currently giving to the Lord, I challenge you to start by making a commitment. Give something faithfully and regularly. I’m certain God will honor and bless your commitment. If a tenth seems too overwhelming, consider making it a goal. Giving may feel like a huge sacrifice at first, but I’m confident you’ll eventually discover its rewards. God wants believers to be free from the love of money, which the Bible says in 1 Timothy 6:10 is “a root of all kinds of evil.” Giving honors the Lord and allows his work to go forward. It also helps build our faith. We may experience times of financial hardship when we can’t give as much, but the Lord still wants us to trust Him in times of lack. He, not our paycheck, is our provider. He will meet our daily needs. A friend of my pastor once told him that financial giving is not God’s way of raising money–it’s his way of raising children.